The view that adorns the skyline to the east of Cuernavaca is enhanced by the majesty of two of the highest volcanoes in the hemisphere, Popocatépetl and Iztaccihuatl. They have existed in unison for approximately 730,000 years. The majestic peaks of the legendary Popocatépetl and Iztaccihuatl volcanoes rise beyond 17,800 feet in elevation, offering a breathtaking sight to viewers. The volcanoes have captured people’s imaginations throughout the ages. Located just a short driving distance of 73 miles (117 kilometer) from Cuernavaca, Popocatépetl and Iztaccihuatl, share a story that reaches back into the mists of time. 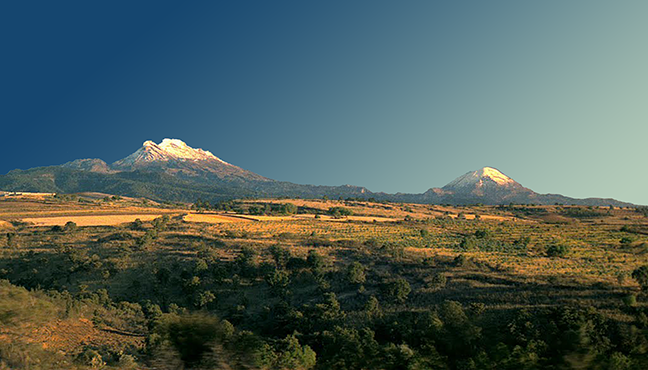 Geographically, these two volcanoes represent the second and third highest mountains in Mexico. Iztaccihuatl is an extinct volcano and is a popular destination for adventurous mountaineers and hikers. Popocatépetl is still active, with the volcano spewing smoke and ash in recent years and it’s peak and crater or closed to the general public. 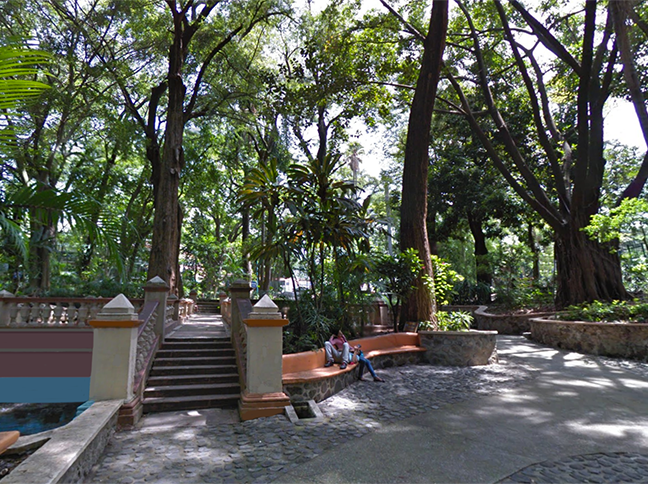 The presences of these enormous millennial volcanoes have been of great significance to Cuernavaca and the surrounding area. 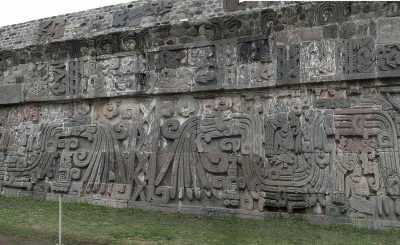 They are a constant reminder of the beauty that has attracted visitors to the area since the Olmec, “the mother culture” of Mesoamerica, first arrived in the area approximately 3,200 BCE1. The volcanic rock ejected from Popocatepetl has long served as a building material and as decorative ornaments in the gardens of residents. The rock walls of many older buildings and homes are constructed of volcanic rock from Popocatépetl, as are the walls that surround the homes. 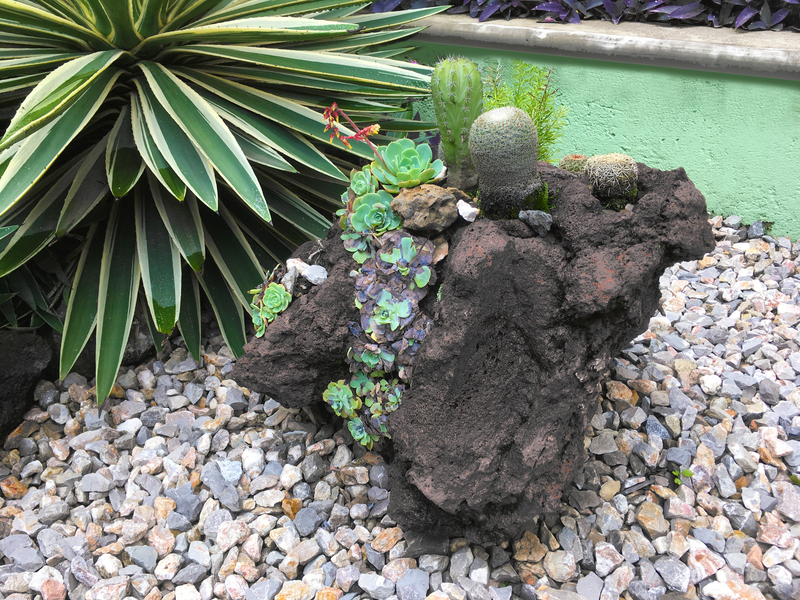 In addition, you will find volcanic rocks bordering the beautiful and colorful gardens as a striking contrast. Popocatépetl became active December 21, 1994 after five decades of quiet and a series of earthquakes signaled that eruptions had started. That morning a gray ash cloud was visible over the top of the volcano, and ash fell on a wide swath of the surrounding area. During the afternoon, the eruptions increased. Because most of the ash was blowing to the east, civil defense authorities decided to evacuate 19 villages east of Popo. Moderate eruptions continued, and the total number of evacuees reached approximately 75,000 people by December 26. The United States Geologic Survey sent a team of volcano experts to Mexico to help Mexican scientists evaluate what the volcano may do in the near future. During the last 23 years the volcano has frequently had a small column of steam rising from its summit crater. 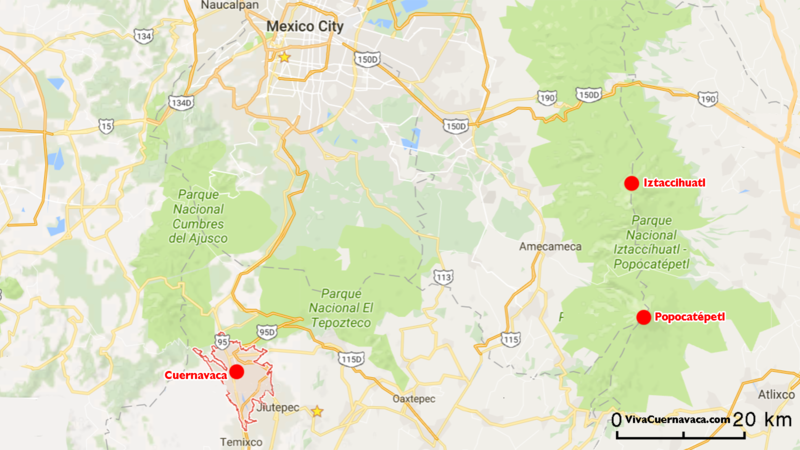 The two volcanoes are located east of Cuernavaca in the Popocatépetl and Iztaccihuatl National Park. 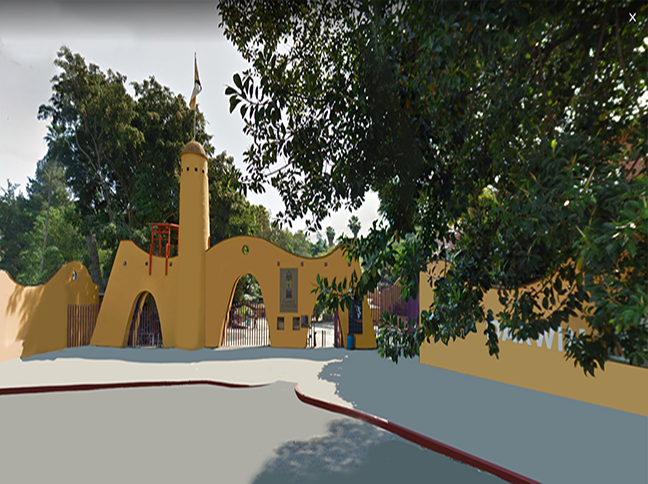 The park is open year round to the general public. Iztaccihuatl is a non-active volcano and is a popular destination for adventurous mountaineers and hikers. Popocatépetl is an active volcano, and as such the peak and crater are closed to the public. Popocatépetl derives its name from the Nahuatl word popōca, which means smoke and the noun tépetl, meaning hill, so its name literally means, “smoking hill,” due to the fumes that emanate from its crater. Popocatépetl is popularly known as El Popo, although the populations living on its slopes know it by the affectionate nickname of Don Goyo, which comes from the mountain’s association in the lore of St. Gregory (San Gregorio), “Goyo” being the short form of Gregorio. Iztaccihuatl, derives its name from the Nahuatl language word iztac, which means white and ciahuatl, which is interpreted as woman, so that its name translates as White Woman. 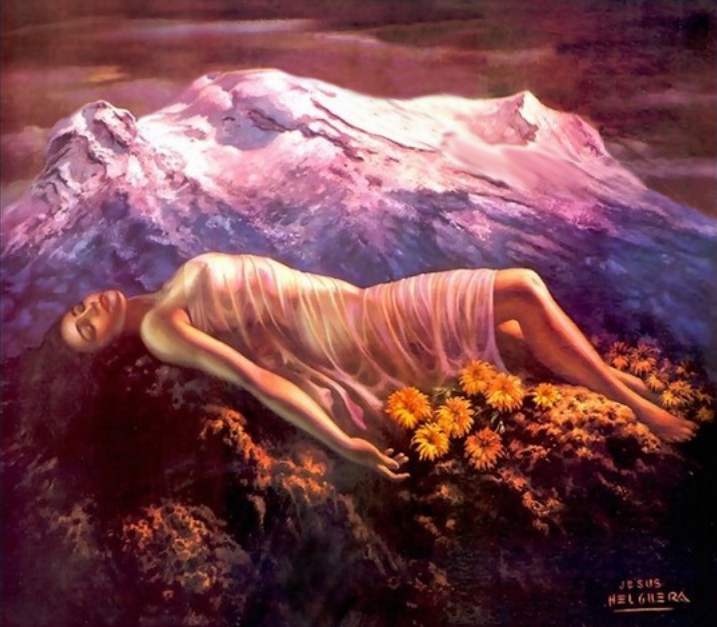 Today, Iztaccihuatl is best known as the Sleeping Woman (La Mujer Durmiente) because of its distinctive profile, resembling resembling that of a sleeping woman with her face turned skyward, complete with head, chest, knees and feet. Until recently, the volcanoes were two of three tall peaks in Mexico to contain glaciers, the other being Pico de Orizaba. In the 1990s, the glaciers greatly decreased in size, due to global warming and increased volcanic activity. By early 2001, Popocatépetl’s glaciers were gone; ice remained on the volcano, but no longer displayed the characteristic features of glaciers in their crevasses. Popocatépetl, at 17,802 feet (5,426 meters) above sea level is the second highest peak in Mexico, behind Pico de Orizaba (Citlaltépetl). It stands proud of the surrounding land by 9,974 feet (3040 meters). Iztaccihuatl is actually four peaks, the tallest of which reaches 17,159 feet (5,230 meters) above sea level is the third highest mountain peak in the country. It appears smaller only due to its rise of 5,118 feet (1,560 meters) making it appear 4,856 feet shorter, rather than the actual 643 feet difference between it and Popocatépetl if they were both setting on the same ground height. They are the second and third largest peaks in Mexico, after the nearby Pico de Orizaba, known as Citlaltépetl, another stratovolcano being the highest peak in Mexico at 18,491 feet (5,636 meters). Pico de Orizaba is the third largest in North America, after after Denali of the United States and Mount Logan of Canada. They are united through the high-saddle mountain pass known as the Cortés Pass (Paso de Cortés), a name that refers to the route taken by the Spaniard Hernan Cortés before reaching the Great Mexico-Tenochtitlan, the Mexica city-state on an island in Lake Texcoco in the valley of Mexico. Founded on June 20, 1325 CE2, Tenochtitlan was the capital of the expanding Aztec Empire in the fifteenth century, until it was captured by Cortés in 1521. According to paleomagnetic studies (the study of the record of the Earth’s magnetic field in rocks, sediment, or archeological materials) Popocatépetl and Iztaccihuatl have existed in unison for approximately 730,000 years. Although, what we recognize as Popocatépetl today is actually an altered version of an earlier volcano during an eruption that occurred during the late-Pleistocene period more than 11,700 years ago. Popocatépetl lay dormant for several decades until December 21, 1994 and the eruptions have become more frequent. The presence of these two volcanoes has been of great significance for the different societies that have admired and revered them, being a source of inspiration for the many legends about their origin and creation. The best known are two that we will relate below. Thousands of years ago, when the Aztec Empire was in its heyday and dominated the Valley of Mexico, it was common practice to subject neighboring towns, and to require a mandatory tax. It was then that the chief of the Tlaxcaltecas, bitter enemies of the Aztecs, weary of this terrible oppression, decided to fight for his people’s freedom. The chief had a daughter named Iztaccihuatl: the most beautiful of all the princesses, who had professed her love for young Popocatépetl, one of her father’s people and the most handsome warrior. Both professed a deep love for each other, so before leaving for war, Popocatépetl asked the chief for the hand of Princess Iztaccihuatl. The father gladly agreed and promised to welcome him back with a big celebration to give him his daughter’s hand if he returned victorious from the battle. Soon afterward, a love rival of Popocatépetl, jealous of the love they professed to each other, told Princess Iztaccihuatl that her beloved had died in combat. Crushed by such tragedy and overwhelmed by sadness the princess died, without even imagining it could be a lie. 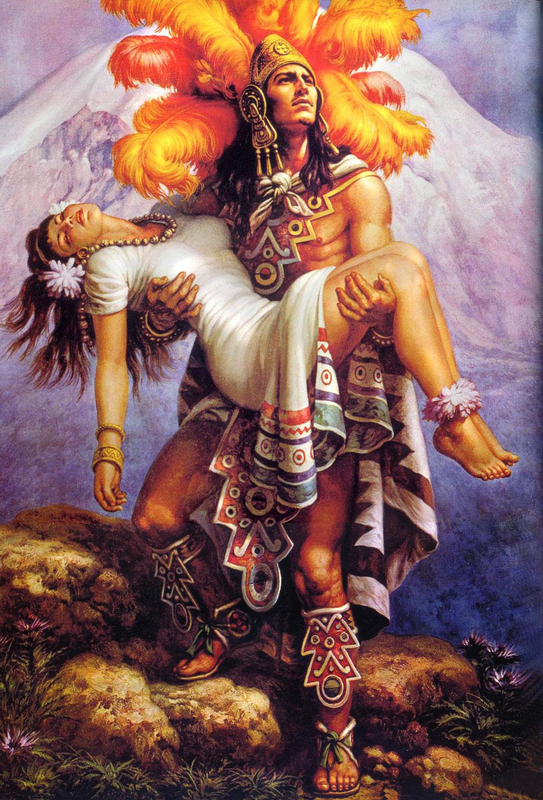 Popocatépetl returned victorious to his people, hoping to find his beloved princess. Upon arrival, he received the terrible news of the death of Iztaccihuatl. He ordered a great tomb built under the sun, piling up ten hills together to form a huge mountain. He carried the dead Princess in his arms, took her to the summit and laid her on the great mountain. The young warrior lovingly kissed her cold lips, took a smoking torch and knelt in front of his beloved to watch over her eternal sleep. From then on, they continue together, facing each other. Eventually the snow covered their bodies, forming two majestic volcanoes that would remain joined till the end of time. That’s why, even today; the Popocatépetl volcano continues spewing fumes. As for the coward, Tlaxcala, who lied to Iztaccihuatl, overcome with repentance for the tragedy that ensued, he went off to die very near his land. He also became a mountain, Pico de Orizaba, another of the region’s volcanoes and now, from afar, watches the eternal dream of the two lovers, never again to be separated. This legend has been passed on from generation to generation since the time of the Aztec Empire, in the XIV century, and the importance given to them is clear, for the names that they have today were given to them since that time. Both Popocatépetl and Iztaccihuatl are volcanoes, however, Iztaccihuatl is at this a non-active volcano, while Popocatépetl is active and continues to spewed gas and ash, which was carried as far as 16 miles (25 kilometers). Occasionally, Popocatépetl will erupt and has been known to shut down flights in surrounding airports as far away as Cuernavaca, Puebla and Mexico City. The elevation of Popocatépetl at the peak is 17,802 feet (5,426 meters). The volcano is cone shaped with a diameter of 16 miles (25 kilometers) at its base. The crater is elliptical with an orientation northeast-southwest. It contains a steep-walled, 1,300 feet × 2,000 feet (400 meter × 600 meter) wide crater. The generally symmetrical volcano is modified by the sharp-peaked Ventorrillo on the NW, a remnant of the earlier volcano. At least three previous major cones were destroyed by gravitational failure during the Pleistocene (126,000 to 11,700 BCE), producing massive debris avalanche deposits covering broad areas south of the volcano. As previously stated, the modern volcano was created to the south of the late-Pleistocene to Holocene El Fraile cone. Three major plinian eruptions, the most recent of which took place about 800 AD, have occurred from Popocatépetl since the mid Holocene period period, some 5,850 years ago, accompanied by pyroclastic flows and voluminous lahars that swept basins below the volcano. Popocatépetl has been active since December 21, 1994, after laying dormant for 47 years. It is important to understand that a volcanic eruption occurs when lava, tephra (ash, lapilli, volcanic bombs and volcanic blocks), and assorted gases are expelled from a volcanic vent or fissure. These are often named after famous volcanoes where that type of behavior has been observed. Some volcanoes may exhibit only one characteristic type of eruption during a period of activity, while others may display an entire sequence of types all in one eruptive series. Magmatic Eruptions — which involve the decompression of gas within magma that propels it forward. Phreatomagmatic Eruptions — another type of volcanic eruption, driven by the compression of gas within magma, the direct opposite of the process powering magmatic activity. Phreatic Eruptions — driven by the superheating of steam via contact with magma; these eruptive types often exhibit no magmatic release, instead causing the granulation of existing rock. Within these wide-defining eruptive types are several subtypes. The weakest are Hawaiian and Submarine, then Strombolian, followed by Vulcanian and Surtseyan. The stronger eruptive types are Pelean eruptions, followed by Plinian eruptions; the strongest eruptions are called “Ultra-Plinian.” Subglacial and phreatic eruptions are defined by their eruptive mechanism, and vary in strength. An important measure of eruptive strength is Volcanic Explosivity Index (VEI), an order of magnitude scale ranging from 0 to 8 that often correlates to eruptive types. The volcanic explosivity index (commonly shortened to VEI) is a scale, from 0 to 8, for measuring the strength of eruptions. It is used by the Smithsonian Institution’s Global Volcanism Program in assessing the impact of historic and prehistoric lava flows. It operates in a way similar to the Richter scale for earthquakes, in that each interval in value represents a tenfold increasing in magnitude (it is logarithmic). The vast majority of volcanic eruptions are of VEIs between 0 and 2. Popocatépetl is the most active volcano in Mexico. Three major Pelean eruptions, the most recent of which took place about 800 CE, have occurred from Popocatépetl since the mid Holocene period, accompanied by voluminous lahars, a type of mudflow or debris flow composed of a slurry of pyroclastic material, rocky debris, and water from the volcano that swept basins below. A violent VEI-6 eruption in the mid-to late first century CE may have caused the massive migrations that settled Teotihuacan, according to DNA analysis of teeth and bones found in the area. The Aztec Indians who lived in Central Mexico recorded additional eruptions in 1347 and 1354 CE, and were recorded in Aztec Codices. Since the arrival of the Spanish in 1519 CE there have been 15 major eruptions recorded. Most of the eruptions in the past 600 years were relatively mild, with ash columns rising only a few kilometers above the summit. Volcanologists have studied Popocatépetl because most volcanoes tend to have future eruptions that are like their earlier ones. Thus, the volcano’s past history helps us prepare for possible future activity. One very important reason to try to predict future eruptions is that more than 20 million Mexican people live close enough to the volcano to be threatened by its eruptions. Below is a list of the more recent eruptions of Popocatépetl, but please be aware that these are eruptions and are more severe than the fuming of smoke and dust that emanate from Popocatépetl more often. 1947 – A major eruption occurred in 1947. 1994 – On December 21, 1994, the volcano spewed gas and ash which was carried as far as 15.5 miles (25 kilometer) away by prevailing winds. The activity prompted the evacuation of nearby towns and scientists to begin monitoring for an eruption. 2000 – In December 2000, tens of thousands of people were evacuated by the government based on the warnings of scientists. The volcano then made its largest display in 1,200 years. 2005 – On December 25, 2005, the volcano’s crater produced an explosion which ejected a large column of smoke and ash about 1.9 miles (3 kilometer) into the atmosphere and expulsion of lava. 2012 – In January and February 2012, scientists observed increased volcanic activity at Popocatépetl. On January 25, 2012, an ash explosion occurred on the mountain causing much dust and ash to contaminate the atmosphere around it. 2012 – On April 19, 2012, there were reports of super-heated rock fragments being hurled into the air by the volcano. Ash and water vapor plumes were reported 15 times over 24 hours. 2013 – On Wednesday May 8, 2013, at 7:28 pm local time, Popocatépetl erupted again with a high amplitude tremor that lasted and was recorded for 3.5 hours. It began with plumes of ash that again rose 1.9 miles (3 kilometer) into the air and began drifting west at first, but later began to drift east-south-east covering areas of the villages of San Juan Tianguismanalco, San Pedro Benito Juárez and the City of Puebla in smoke and ash. Explosions from the volcano itself subsequently ejected fragments of fiery volcanic rock to distances of 2,297 feet (700 meters) from the crater. 2013 – On July 4, 2013, due to several eruptions of steam and ash for at least 24 hours, at least six U.S. airlines canceled more than 40 flights into and out of Mexico City and Toluca airports that day. 2014 – During 27 August–September 2014, CENAPRED reported explosions accompanied by steam-and-gas emissions with minor ash and ash plumes that rose 9,843 feet (3000 meters) above Popocatépetl’s crater and drifted W, SW, and WSW. On most nights incandescence was observed, increasing during times with larger emissions. On 1 September partial visibility due to cloud cover was reported. On 29 and 31 August the Washington VAAC reported discrete ash emissions. 2015 – On January 7, 2015, CENAPRED reported that ash from recent explosions coats the snow on the volcano’s upper slopes. 2016 – On March 28, 2016, an ash column 6,561 feet (2,000 meters) high was released, prompting the establishment of a 7.5 mile (12 kilometer) “security ring” around the summit. On 3 April 2016, Popocatépetl erupted, spewing lava, ash and rock. 2016 – Eruptions have continued in August 2016, with four discrete blasts on August 17. This volcano is monitored by the Deep Earth Carbon Degassing Project. Currently, both volcanoes have always been a great source of artistic and literary creations, which will likely continue in posterity. In 1936, Malcolm Lowry wrote his short story, Under The Volcano, which inspired his 1947 novel of the same name. The novel is considered one of the top five greatest books of the twentieth century, and has never gone out of print. Cuernavaca, or “Quaunahuac“, as it is referred to in the novel, and the surrounding area, figure prominently in this great historical novel, where extensive details on Mexican history, culture, topography, and especially, politics and religion figure prominently. The recurrent artifacts are the twin volcanoes, Popocatépetl and Iztaccihuatl, and the streams (barrancas) that bring the spring waters into the city from the highlands — symbols of division, death, and rebirth in The City of Eternal Spring — La Ciudad de la Eterna Primavera. 1 and 2 – BCE (Before Common Era), which before the 17th century was referred to as BC (Before Christianty) and means previous to year 1 CE (Common Era), which previously was referred to as AD (Anno Domini). Secor, R. J. (2008). Mexico’s Volcanoes: A Climbing Guide (3rd ed.). Mountaineers Books. pp. 160ff. ISBN 0-89886-798-3. “Popocatépetl”. Global Volcanism Program. Smithsonian Institution. Retrieved 2008-12-18. Yarza de la Torre, Esperanza (1971). Volcanes de México (in Spanish). Aguilar. pp. 237ff.